The teens took a college trip to University of North Texas on Saturday April 2, 2011. They were able to attend various workshops that provided them with an abundance of information about the university, and the different majors they offer. They also learned about the extracurricular activities that they could get involved in if they were to become a student on that campus. 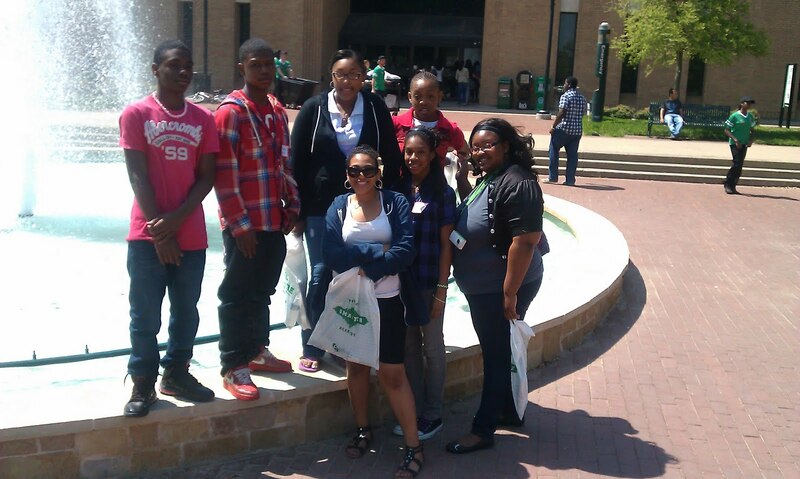 The teens enjoyed visiting the University of North Texas, and they had many questions about life on a college campus. They absolutely can’t wait to go visit other Universities. After the college tour, they were able to tour an organic restaurant and grocery store so they could learn more about organic foods and how they are grown and prepared. The teens really enjoyed touring the grocery store and reading the labels on many of the food items to see how they differed from other food items that they normally eat and buy from the grocery store near their home. During the spring break Lock-In, the teens tried to solve the Rubik’s cube. Some of them found it easier to use the book “The Simple solution to Rubik’s Cube”, and some of the teens thought it would be easier to figure it out on their own. The teens stayed up until 3am making it a friendly competition between them. Some of the teens were so determined to solve the Rubik’s cube that night, that they fell asleep with the Rubik’s book and the Rubik’s cube beside them (Maybe they thought the solution would come to them in a dream J ). The Rubik’s cube challenge continues! Every Monday evening Mid Teen University has a book club at various eateries throughout the North Dallas area. We host the book club at different eateries so that we can challenge their taste buds, and expose them to various foods that they might not have chosen to try if they were out eating on their own. For the past few weeks they have been reading the book “Seedfolks” by Paul Fleischman. The teens are not only enjoying this book because they can relate to the garden elements, but they are personally relating to the story and struggles of many of the individuals in the book. They often relate some of the challenges that are expressed in the book to their own life and personal challenges that they experience in their community. The teens are reading the book Seedfolks by Paul Fleischman. This book has a lot to do with gardening in the city. So we decided to take the teens to the Texas Discovery Gardens at Fairpark so they could get more back ground information about gardening in the city, as well as gain information about maintaining their garden at the ASA. MTU went to Texas Discovery Gardens for one of their spring break fieldtrips. The Texas Discovery Gardens were offering many different and activities throughout the week of spring break. One of their themes for the week was “Garden in the City,” and because of this they offered many garden related activities, and information sessions relating to gardening in the city. Some of the things that they learned about were composting, planting wild flowers, greenhouses, and etc. 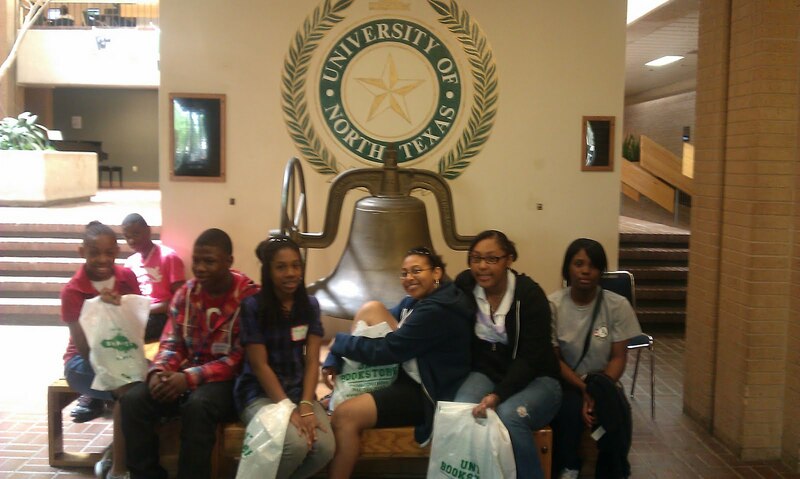 The teens enjoyed the Texas discovery gardens, and they were able to gain a lot more knowledge about gardening in the city! The challenge in this design squad activity was to see if the kids could figure out ways to use tubes of newspaper to make a table that is at least 8 inches tall, and strong enough to hold a heavy book. This activity called for a lot of trial and error, but once the kids were able to figure out ways to make a paper table that was tall enough and strong enough, the challenge was on! Eventually, it became a competition to see who could make the strongest table, and whose table could withstand the most amount of weight without tumbling over. I do believe watching problem solving in action is one of the most exciting parts of being an educator. Design Squad is a science and engineering curriculum created by PBS for middle schoolers. Some of the concepts are pretty complicated and I'm not sure that the kids grasp everything just yet, but I think challenging them to think through it and see what they can do is fun to watch. "Miss Janet, what is your inspiration?" One of the teens had taken the Flip video camera to interview people on our field trip. "What is your inspiration?" was his question of the day. "You guys," I replied. I saw a slightly odd look on the videographer's face like, "What is this lady talking about?? "I tried to explain, though I don't know that I was able to express my sentiment in a way that completely described the depth of my statement. I probably can't do it much justice here either, but I'll try. Quick. Watching the teens handle technology that they've never touched before and take to it so quickly. Knowledgeable. Seeing the kids in our After-School Academy garden and listening to them explain the difference between grub worms and earthworms, tell about the tea mixture they created to make the garden grow, and explaining how diatribes can get rid of ants. Passionate. Listening to young adults who teach the kids get as excited as the kids about what they are teaching. Growing. Seeing the maturity of a college student in a text telling me, "Everything has a reason," and, "Something better will come along,"
Demonstrative. Hearing a teacher at the elementary school encourage the kids to get to the After-School Academy because, "They're learning so much about science there! They are my students who speak up in science class." Eager. Hearing about teens who, before going to see Maya Angelou on Friday, rush home from school and immediately go to the computers to begin looking up information on her. Appreciative. Appreciation is often covert. I feel love and appreciation when a middle school boy acts like he doesn't want to participate yet has a sparkle in his eyes as he does participate and learns something new. Excited.When a few kids begin pushing the other kids to learn and rise to expectations we've set, the many other frustrations go away (at least for that moment). I am thrilled when I am told about different youth who are having extraneous conversations about Nobel Peace Prize winners, life skills they've learned, technology, and game nights. Youth and their minds inspire me. People in poverty seeking to overcome inspire me. Knowing a kid has potential and pushing, pushing, pushing until that kid begins to see his/her own potential motivates me beyond anything I could explain. This past Friday we gave the teens a choice to continue our traditional Friday night Game Night or to go see Maya Angelou at the Northwest Hwy Barnes and Noble. The group was split in half. The girls wanted to see her; the boys did not. Making an executive decision about what would be most beneficial to everyone in the group, I decided everyone would go see Dr. Maya Angelou speak. After all, it was an opportunity of a lifetime...and it was FREE! Knowing she would arrive around 7:00, we had decided to leave at 6:00. However, when we called at 4:00 to find out more details, the store employee informed us that there were only 150 seats available and people had already started arriving. The Americorps members overseeing Teen U and Mid Teen U scrambled to make phone calls and push the teens to hurry home from school so we could leave. Around 5:00 we had finally gotten the last permission slip needed. The store wasn't overly crowded when we got there and we were able to find seats about halfway back. We sat and waited...for about two hours. At 7:00, they raised the black curtain they had set up as if they were revealing a piece of artwork. It seemed odd but I guess, in a way, Dr. Angelou is that precious and rare so why not?? At her first words, the audience began to silence. However, in the 30 seconds to a minute it took the audience to settle down, Dr. Angelou had finished speaking. She was ready to sign books...and we didn't have the wristbands needed to have that opportunity. The teens were disappointed. They couldn't understand, despite her age and breathlessness, why she couldn't/wouldn't say more. In hopes of them taking home something from the experience, we drove down the street to Half Price Books. I purchased 5 Maya Angelou books and we did a drawing to see who would get to take home one of her books. I watched the bravado of the boys, but I also saw the interest some of them showed in knowing more about her. After purchasing the books, we quickly drove back over to Barnes and Noble just in case she might speak her words of wisdom. Luckily, right after we got back, she did say a few more words which, I can only hope, were enough to inspire the teens and help them understand her greatness. Here is a video from the evening. Unfortunately, because of youtube's strict rules these days, the video doesn't have any music with it (until I figure out how to use OpenSource music). However, music or not, I always find the words of people in our Education Department completely inspiring and encouraging.